Offering you a complete choice of products which include co2 laser machine. 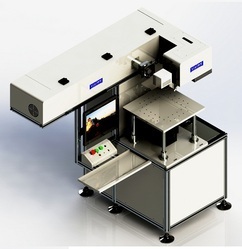 Vision Embesoft Solution offers LPCO2 CO2 Laser Machine. CO2 Laser Machine is pumped with Sealed CO2 Gas. CO2 Laser Machine allows to Marking, Engraving on Acrylic, Venner, MDF board, Plywood, Masonite, Rubber, Vinyl, Foam, Nylon, Cloth, Textile, Polycarbonate, Fabric, Chipboard, Paper, ABS, Polyester, PP Leather. LPCO2 is applicable for Acrylic Display, Decorations, Signs, Gaskets, Architectures Models, 2D Prototypes, Marquetry, Embroidery and Textile, Router Template Stencils, Photo Frame.